We may not be New Orleans, but we do serve our own Houston beignets and they are delicious. Maybe you want a taste of New Orleans, but you can’t travel there. That’s okay, just stop on by. We’ll give you the taste of the French quarter you’ve been looking for here in Houston. So, what exactly are beignets? You can say they’re like a French donut, minus the holes and circle shape, with a generous dust of confectioners sugar. In short, they’re a sweet and delicious dessert. Why do you need to try it? The real question is, why not? If you didn’t know yet, beignets are apart of the French Creole culture of New Orleans, Louisiana. 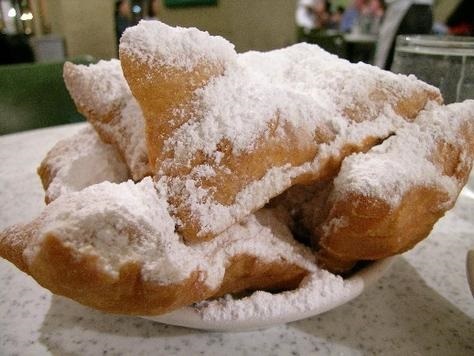 Besides their jazz music and Cajun food, New Orleans is also famous for their beignets. They have a long history, coming from ancient Roman times. Later on, the French settlers came over and brought them to Louisiana. Fast forward to more modern days, beignets are still around and staying strong. A popular place to find these treats in New Orleans is at Cafe du Monde. Luckily, you don’t have to travel all the way to the French Quarter. With us, you can experience the sweet taste of New Orleans, especially with powdered sugar (we advise not to wear black). With Mardi Gras around the corner, you might want to take a few with you before the end of Fat Tuesday (in case you give up sweets for lent). Usually people serve beignets during Mardi Gras. It’s a great way for you to get your fix and eat as many sweets before you have to give them up for lent. If you’re throwing a party for Mardi Gras, these are the perfect treats to share with your guests! And if you’re not giving sweets up, then you can enjoy beignets just a little bit more! One great thing about being in Houston is the amount of options you have for food. And if you didn’t know it before, now you know there’s also an option for Cajun desserts. Besides sweet tea and BBQ, the south does have other foods that fill up and satisfy your hunger. With another option of some delicious food, might as well get you some good southern cooking. With Houston being a diverse city, might as well get your fix. If you have yet to try a beignet, well what are you waiting for? Don’t miss the experience of getting a taste of New Orleans right in your own city! Call us today at (713) 589-3292 or order online for store pick up. If you would like to share some with a group of people, we provide catering and delivery. So whether you’re stuck behind a desk or spending time with a group of friends, you don’t have to drive around Houston looking for beignets. Just come on down to our West Houston Shipley donuts and discover the best Houston beignets around.